Merritt Carmen Wever (born August 11, 1980) is an American actress. She is known for her role as the perennially upbeat young nurse Zoey Barkow in Nurse Jackie (2009–2015), for which she won the Primetime Emmy Award for Outstanding Supporting Actress in a Comedy Series in 2013; for a main role in the Netflix miniseries Godless, for which she won the Primetime Emmy Award for Outstanding Supporting Actress in a Limited Series or Movie in 2018; and for her supporting roles as Suzanne in Studio 60 on the Sunset Strip (2006–2007), as Elizabeth in New Girl (2013), and as Denise Cloyd in The Walking Dead (2015–2016). Wever has also played supporting roles in such films as Michael Clayton (2007), Tiny Furniture (2010), and Birdman or (The Unexpected Virtue of Ignorance) (2014). Wever was born in the New York City borough of Manhattan. She was conceived via a sperm donor and raised by her mother, Georgia. She graduated from Fiorello H. LaGuardia High School and Sarah Lawrence College, and she trained in acting in New York. Wever began her career starring in low budget, independent short and feature films. She has also performed in theatre productions, including a performance in Brooke Berman's play, Smashing, and in Cavedweller with Deidre O'Connell, both off-Broadway. Since she began her career, Wever has performed in numerous feature films, including: Into the Wild, Neal Cassady, Michael Clayton, Series 7: The Contenders, Signs, The Adventures of Sebastian Cole, Bringing Rain, Tiny Furniture and All I Wanna Do, among others. She has guest starred on a number of TV shows, including The Good Wife, Conviction, Law & Order: Criminal Intent and The Wire. She also starred in Ed Zwick's ill-fated ABC pilot, Quarterlife, with Rachel Blanchard, Austin Nichols, and Shiri Appleby. She also had a recurring role on Studio 60 on the Sunset Strip as Suzanne. Wever is perhaps best known for her role as Zoey Barkow in the dark comedy series Nurse Jackie, which premiered on Showtime in June 2009. 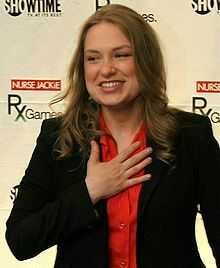 Zoey is described as on the official Nurse Jackie website as "an irrepressibly bubbly trauma nurse, who serves as a comic foil to Edie Falco's hard-bitten (and prescription drug-addicted) titular character". Wever received widespread critical acclaim for her role on the show. Wever was nominated for a Primetime Emmy Award for Outstanding Supporting Actress in a Comedy Series in 2012 and 2013 for her role in Nurse Jackie, winning the award in 2013 and delivering a memorable speech that consisted only of her stunned reaction: "Thanks so much. Thank you so much. I gotta go. Bye." In 2016, Wever had a recurring role on AMC's The Walking Dead as Denise Cloyd. Her character's death towards the end of the sixth season of the series was controversial and sparked outrage on social media with many fans, most notably members of the LGBT community. Wever played a lead role in 2017's Netflix miniseries Godless, as Mary Agnes McNue, a tough leader of a female-dominated town. She said in interviews that she had been intimidated by the role: "I spent so much of this shoot thinking I would come off as a fool, that nobody would buy me as this and it wouldn't be believable." Many critics nonetheless noted her character as a highlight of the show. Entertainment Weekly titled its review of Godless "Merritt Wever rides tall in Netflix's Godless" and wrote that "no one is more electric than the always extraordinary Merritt Wever". In 2018, she won an Emmy for this role. 1997 Law & Order Myra Episode: "Mad Dog"
2002 Law & Order Jennifer Taylor Episode: "American Jihad"
2002 Law & Order: Criminal Intent Hannah Price Episode: "Tomorrow"
2005 Law & Order Sunshine Porter Episode: "Sects"
2005 NCIS Wendy Smith Episode: "Switch"
2006 Conviction Bridget Kellner Episode: "Pilot"
2012 The Good Wife Aubrey Gardner Episode: "After the Fall"
^ Blank, Matthew (June 21, 2011). "PLAYBILL.COM'S CUE & A: 'Nurse Jackie' and The Illusion Star Merritt Wever". Playbill. Retrieved 2019-02-23. ^ Maerz, Melissa (March 29, 2011). "Merritt Wever brings undoctored flair to 'Nurse Jackie'". Los Angeles Times. Retrieved February 24, 2014. ^ a b "Merritt Wever: Biography". TV Guide. CBS Interactive Inc. Retrieved February 24, 2014. ^ "Merritt Wever". The New York Times. The New York Times Company. Retrieved February 24, 2014. ^ a b "Merritt Wever". IMDB. Retrieved December 8, 2017. ^ Maerz, Melissa (March 29, 2011). "Merritt Wever brings undoctored flair to 'Nurse Jackie'". Los Angeles Times. ^ "Nurse Jackie: Official Site". Sho.com. Archived from the original on February 28, 2009. Retrieved March 3, 2009. ^ "'Nurse Jackie' sidekick Merritt Wever stays grounded". USA TODAY. Retrieved 2016-04-18. ^ Chan, Robert (September 22, 2013). "Best. Emmys. Speech. EVER: An Underdog Takes Home an Emmy". Yahoo!. ^ "The Walking Dead Actor Responds to Controversial Death on Last Night's Episode". www.themarysue.com. Retrieved 2016-04-18. ^ "'The Walking Dead' Fans Outraged That Another Minority Character Has Died". The Inquisitr News. Retrieved 2016-04-18. ^ Robinson, Joanna. "The Walking Dead's Latest Gruesome Death Is Part of a Troubling TV Trend". Vanity Fair. Retrieved 2016-04-18. ^ McHenry, Jackson (November 30, 2017). "How Merritt Wever Found Vulnerability in Godless's Toughest Character". Vulture. Retrieved December 8, 2017. ^ Shaw, Jessica (November 16, 2017). "Merritt Wever rides tall in Netflix's Godless". Entertainment Weekly. Retrieved December 8, 2017.